The busier we are, the more important items like planners and PDAs are. I, for one, live by my Google Calendars, and I’ve long wanted the ability to access it on my Apple device (the default Apple calendar app just doesn’t do it for me). With entwicklungsschmiede’s miCal iPhone app, I come that much closer to having that wish come true. To use miCal fully, make sure you have all the calendars you want to have access to synchronized to the default Apple calendar app. 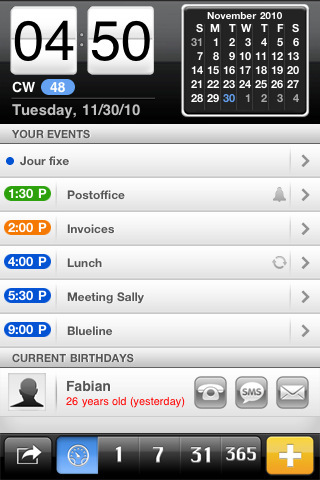 miCal has five different views: day, week, month, year, and a Dashboard page that changes daily to reflect your events. In all the calendar views, you can swipe left or right to move back and forth between days, weeks, months, or years (the weekly calendar can be viewed in either landscape or portrait orientations). Your Dashboard page can be customized to show up to seven days worth of future events by going to settings (the first button on the bottom). From the Dashboard, daily, and weekly views you can choose a specific event to edit or delete by tapping on it. In the monthly and yearly views, tapping and holding on a day or month (respectively) will expand to that specific day or month. If your events are being pulled from other calendar, remember to sync the default Apple calendar app before firing up miCal, or all the events you’ve added since your last sync will not appear. Any calendar that can be synced with the Apple calendar app is supported by miCal. The large yellow + button on the bottom right can be used to add an event directly to this app, or a double tap to a specific day in all views except the yearly view. Events can be accompanied by an alarm and GPS coordinates (which will launch the Google maps app). miCal is excellent for users with multiple calendars that want to consolidate them all into one calendar; otherwise, the default Apple calendar app would probably be enough for a regular Joe. I love the customizable Dashboard view, which is like a visual daily to-do list for me. I dislike having to sync the default calendar app beforehand because it just seems like an extra step; I don’t know the legal ramifications of just syncing all other calendars directly through the app, but I wish we could do that instead. The biggest gripe I have with miCal, though, is the lag. It is very noticeable, especially if you’re swiping between days, months, etc. Optimization is a real issue here. 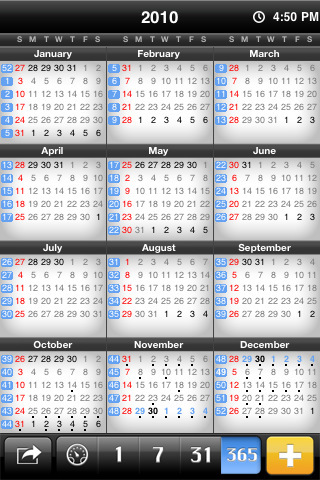 miCal is an awesome calendar app, but it needs a little cleanup before I’d give it a 5. AppSafari review of miCal – missing Calendar was written by Julie Guan on March 9th, 2011 and categorized under App Store, Calendar, Utilities. Page viewed 6905 times, 1 so far today. Need help on using these apps? Please read the Help Page. Great product. Please make it even better by adding the option to select a “repeat every specific day (not date) of each month” in Frequency, as in every third Friday, or last Monday of the month. Thanks.